Get 30 mile range with SSB - now Legal! Photos Wanted - £30 Discount Voucher Prize Every Month! 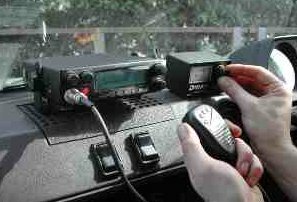 CB radio has always been intended as a simple, short range, two-way band service available to the general public without the need for technical know-how and as such is (in most cases) extremely easy to fit and use. To get yourself up and running you will need a CB set, an aerial fixed to the vehicle and a lead to connect the two! 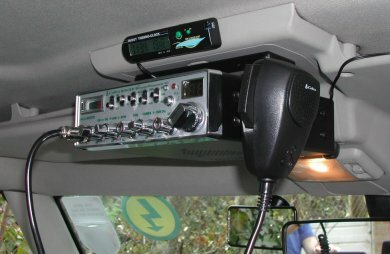 If you just want to have the CB for when you go away and would prefer not to have it there normally, then you can have the easiest installation of all - the set plugged into your cigarette lighter socket for power, and a temporary bracket on your side mirror arm, roof grab rails, luggage bars or ladder, or magnetic mount on a metal panel. Permanent Installation If you prefer to have a permanent fixing, this can be almost as simple to do and gives you the benefits from having the CB every time you are on the road as well as being a more convenient & reliable system compared to a temporary setup. Even when you get to where you are going, and especially If you are in a group that places a high emphasis on the social and friendship aspect, then why loose the ability to all chat together, just because you're no longer sitting in the drivers’ seat and you don’t fancy sitting outside together all night? We can supply you with any extension cables, spare power leads, brackets and switches should you wish to install a second unit within the living space or simply make the drivers unit easily transferable to (or useable from) there. A good way to find out local information and events, chat to the locals and be able to get an idea of traffic conditions, before you leave to go anywhere! Please don't forget - If you would like us to suggest a suitable complete package for you, please call - we can discuss what you might need and can put together the most suitable system for you. Hopefully the information in our catalogues and on this site will give you a insight into what equipment might be best for you, but please feel free to get in contact with us if you have any questions at all, either for first-time users, or advice on improving a current CB set-up. We will take the time to listen to what you would like to do, and suggest them kit to do it. As with a lot of things today, you do get what you pay for although in truth there are no really "bad" CB's made now - what you do get when you spend more is general build quality and increased life expectancy of the equipment. Having said this - there are certain CB's that are better than others and this doesn't automatically mean the most expensive! We have our proven favourites that we know will give problem free service (the Midland 48 Excel in our catalogue is a good example of this) but we stock every CB currently available. A budget CB may well transmit as far as a more expensive unit but the sound quality (both transmitted and received) might not be so good. The more expensive sets tend to use better quality switches and controls, so you would expect them to last a bit longer. 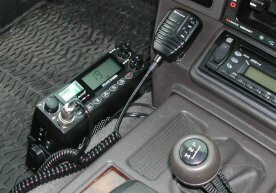 The alternative to a conventional vehicle mount CB set is to use a hand-held unit. Unfortunately these do not work very well from inside a vehicle (especially a metal vehicle) with their own aerials, but connect them to an external aerial and they will work just as well as the vehicle sets - with the advantage of being able to use the large number of different hands-free speaker/microphone units in our catalogue. 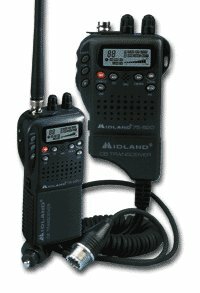 There are currently two hand-held CB sets available, the Midland 42 and the Maycom AH27, they are both roughly the same size, with similar features & facilities. All of our vehicle mount CB sets come complete with a power cable, usually 4'-6' long with inline fuse, and they all need a connection to the 12v power in your car. Run the power cable to a connection on the fusebox or straight to the battery. Alternatively, patch into the power feed to the stereo. With modern CB’s powered by either method, you should not suffer with much interference from the vehicle itself (ignition, alternator, wipers etc) but if you do, we can supply interference filters and hints and tips or curing such problems. Where to put a CB is different for every vehicle, and can depend on how much other stuff you've got on or around the dash, and on things like how long your legs are (fit under the dash on the drivers side or not)! You will need to make sure that it is well secured - just in case of an accident. You would NOT want a heavy, sharp-edged metal box flying around the drivers area with you if you were involved in an accident. Inset into the centre console - if you have room! With safety issues in mind - it may be possible to jam the set between seat and transmission tunnel, padded out with a jumper or similar, or to cover one side of the CB with heavy duty Velcro strips and stick this to the carpet somewhere around the cabin, but please try to make it as secure as possible. 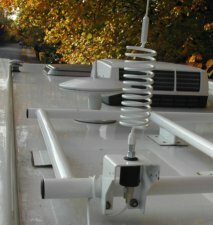 A common problem on motorhomes is that most aerials need a connection to earth or ground (or a large enough metal object to act as ground) in order to work. With a conventional steel bodied vehicle, the body itself is a large enough object to provide a ground, but a body that is made of GRP or some other composite material will not conduct electricity and cannot give the aerial an earth. This means it will not work work properly and may end up damaging the CB set. I won’t get too technical here, but to work properly, an aerial has to be a certain length, and it has to have an “earth” or “ground”. The way to find out If the aerial does have an adequate ground, and that the aerial is the right tuned length, is by using a small and simple test meter called an SWR meter. Simply, what this does is measure the amount of energy that is not being radiated by the aerial and is coming back down into the set. If your aerial simply needs tuning for length, you will have more energy than ideal being reflected back, but as you get close to the right length (most aerials have some form of easy adjuster on them, or by simply cutting the whip), this will decrease, until you reach an acceptable level, and the aerial is tuned. But if you have no earth for the aerial, you will find pretty much all of the energy is not being radiated, and no matter how much adjusting you do to the aerial, you will still have a very high reading on the meter. This energy is being absorbed by the circuits inside the set, and they won’t like this very much - they will heat up and eventually burn out leaving you with a hefty repair bill or having to buy a new CB. We explain how to use an SWR meter elsewhere on this site, so I won’t go into further details here, but if you need any help or assistance, please don’t hesitate to call us. Marine CB aerials are designed with a circuit inside the base of the aerial which provides an artificial Ground Plane, so that they can be mounted anywhere on a boat without the need for a conventional earth connection. This means they can be mounted on your motorhome, camper or caravan with no connection to earth needed here either. Marine CB aerials are designed for very harsh environments so will generally be made of high quality components and be well constructed. They are white in colour, so will usually suit the colour of a motorhome, as will the cable (where it is supplied in the kit) - this will be white also. Most of the marine CB aerials have a foldover system which enables them to be mounted on your vehicle horizontally or vertically, or anything in between and be able to have the aerial standing straight up or folded down flat - as you need. Those aerials designed for deck mounting have usually got a much larger “footprint” than the vehicle mounting ones, which helps to spread the load better on your roof or panel where it is mounted. Solarcon Ground Zero This is a more conventional vehicle mounting aerial, but one that also features an artificial ground built in. It is quite rigid and needs a sturdy mount. The aerial screws into a standard 3/8” mount as found on nearly all the mounts we sell, but this is just to hold it to the vehicle - the cable connection is actually a “T-piece” a couple of inches up the aerial which also acts as the SWR tuning adjustment. Actual length is 4’ yet effectively 18’ long - works well. 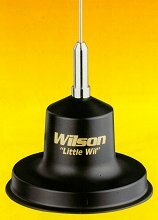 Designed as a small base aerial, this aerial can also be used on vehicles, although not suitable for all situations. Black in colour and fitted with a vertical-surface or pole-mount bracket. Does not have an artificial earth, instead it requires a cable of specific lengths in order to SWR tune. Call for price and different versions available. 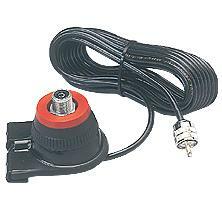 This item forms your aerial mount - it has a standard 3/8” thread for most aerials to screw into the top, and a socket on the bottom for a standard CB plug cable connection. This item is not actually “electronic”, and like the marine CB aerials it requires no separate power supply. It can be mounted on a bracket or plate of your own, or put on one of our mirror mounts for fitting in any number of places. You may need an EGP if you plan to mount the aerial on your rear ladder, although not if it is bolted directly to metalwork (frame, etc). Not recommended for rigid or heavy aerials, so is ideal for use with the Springer. This is an good fix, but although it will get the SWR quite low, so no damage will be done to the set - the radiation pattern of the aerial will not be ideal, so you might find your signal is rather directional, and you cannot transmit quite as far as you might expect if you had a groundplane directly under the aerial. You can do this easily with most of our mounts but you have to be careful to run the lead from the place on the mount that would normally make a metal-to-metal connection if you were fixing to a metal panel, and not from the actual aerial itself. Our dome, stud & mini 3/8 mounts and the Opek PSM-1 mount shown here are ideal if you want to take this route. Dome, stud & mini mounts can be used but put a strengthening plate behind the GRP roof/side panel, to spread the stress evenly across the panel. If you have a grabrail or luggage rail going along the edge of part of your roof, this can be an ideal place to mount an aerial. You would usually have to use an Electronic Ground Plane, as the rail on it’s own is unlikely to be enough to act as a ground on its own. However, it does depend what it is bolted to...if it’s the metal framework then you should be ok without an artificial ground. If you want to get technical, you could use a continuity meter to see if there is a circuit between the rail and another metal part of the vehicle - frame, or seatbelt mountings. If you have a ladder for access to your roof, you will probably find that this does have a good connection with the frame and will be a good place for a plate or bracket for one of our dome or stud mounts. 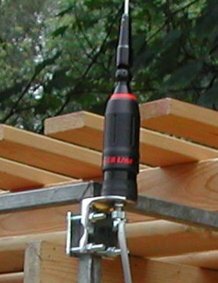 We can supply these with angle adaptors so that you can get your aerial standing straight up, even if you have to put the mount on a slant. You may have seen trucks and lorries with aerials fitted to their mirror arms, and this is also a good place on a motorhome - if your mirror arms are big enough. The picture of the mirror mount shows it without an EGP fitted, but if you bolt it to your mirror arm you should not need the artificial ground as the mirror arms should be bolted to the frame. 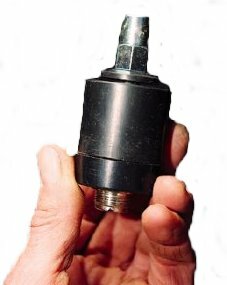 Occasionally rubber bushes are used to minimise vibration, so it might pay to examine yours if you are considering using this mount. Again, a continuity meter will help you tell if there is a good enough connection. Photo : Here we see a Sirio Hipower on a standard mirror mount, mounted on a roof rack - this bracket can be made to fit horizontal or vertical bars of round or square section. This method is not always as drastic as it sounds - you probably already have a hole somewhere for a radio aerial, and this is a good solution for those wanting a permanent mount. You can also use these mounts on a metal panel like the wing, or other panels on some campers as the ground connection is made where the mount bolts on. You will need to scrape some paint away to get a good metal-to-metal connection. We can supply a splitter box that enables you to use a CB aerial for both the CB and your car radio, and although you need a fairly large aerial for this to work well - it means you still only have one hole in the roof, but both radio and CB will work. Unfortunately you cannot transmit on the CB while listening to radio - but you can listen on both simultaneously. These sort of mounts can also be put onto a bracket or plate, so can be used in a variety of different ways to mount an aerial almost anywhere. There are various types available and we suggest you contact us to discuss what would be best for your vehicle. Gutter mounts are designed to go over the lip of your gutter, (they need a “conventional” lipped gutter, so are not suitable for all vehicles) and have two thin bolts that tighten down into the trough of the gutter to hold it on. These also make the ground connection if you have a metal roof you will need to scrape the paint away down to shiny metal where the ends of these bolts tighten down. An earth lead can be used from the gutter mount to an earthing point. If you wish to protect this against corrosion, you can use a rust inhibiting paint or a spray-on plastic seal spray, which is normally transparent - obviously a better solution aesthetically. If you have a metal roof, or want to install CB into a car or van, magnetic mounts are an excellent way of mounting either permanently or temporarily but especially if you just want to have the aerial on for a week away or a particular event. All the magnetic mounts we supply come with cable and plug attached - all you have do do is put them on the roof, screw the aerial on and plug it into the set. Bear in mind that magmounts will only work if your roof is steel, so fibreglass roofed/cabbed vehicles and most Land Rovers wont be able to use them. 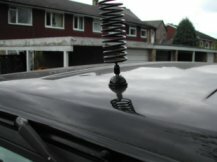 Magmounts are simply placed on the roof, ideally in the middle although elsewhere on the vehicle will usually be ok as long as there is enough metal for it to stick to, and that the aerial is not obscured by anything. You are usually ok to bring the cable in through the door jamb or alternatively, an open window or sunroof might be available in summer. Many of the magnetic mounts have a rubber boot or vinyl pad to protect the roof, and as long as you make sure there is no grit or dirt on the roof prior to putting the magmount on you should have no clue that an aerial has ever been there once it's removed again. The only way you can get damage from using a magmount (and this damage can be very dramatic!) is if you try to use a magmount that is too small for the aerial, or by using an unsuitable aerial. The rigid types of aerial, like the "Firestik" are not suitable for magnetic mounting - they have no ‘give’ in them, and are too thick - producing too much wind resistance. If you purchase the equipment from us - we will ensure that you have a mount and aerial that are suited to each other, and that they will be safe at normal motorway speeds (i.e. 70-80 mph), so you will have no problems whatsoever at towing speed. There are a few magnetic aerial kits available, where you get an aerial, magmount and cable all in one package - these range from "cheap-and-nasty" budget kits through to rather stylish bits of kit! If you choose an aerial fixing where you can use a standard aerial, there is quite a choice available to you. If you are in any doubt at all, give us a call so we can discuss the vehicle, the different mounting options, and what you actually want to do with the CB and any budget you want to keep to. We can suggest what would work best and give you all the advice you might need to get it working right. All of the aerials in our catalogue use some kind of coil in them, as they actually need to be 9' long or more to work properly. Obviously none of these are physically 9' long (although we can supply one this big! ), so they use a coil to make up the rest of the length needed. An average 4' long aerial would have a 4' thin steel whip and a small loading coil with the other 5' coiled up inside. Looking through the aerials on this site, it might seem like a bewildering choice, but here’s a bit more info about our most popular aerials. The Springer is an aerial which you may have seen bolted to the mirror arms on lorries, they are very popular with HGV drivers as they are very flexible and wont break if hit by trees. These aerials have an open coil which is effectively a big spring so they are extremely flexible and will bound around all over the place, and will lean back at an angle at motorway speeds. The Dial-A-Match is a discreet aerial where the loading coil is in a small rigid section at the bottom of the aerial which incorporates 2 rings for easy tuning. There are three sizes available, 2', 3' and 4' and this proven design has been around for a long time! A unique aerial, designed to look like the now fairly common “bee-sting” car radio aerial. This aerial requires a through-hole fitting so cannot be used with a magnetic mount. Only average performance but this aerial does not look like a CB aerial and would normally go completely un-noticed. 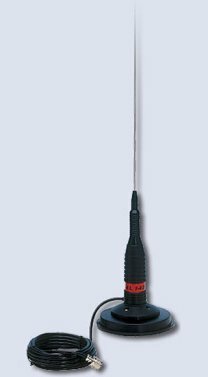 The Mythos 9000 is a fairly small high performance aerial that will transmit further and hear more than almost every other aerial available. This is because instead of being 9' long (including the coiled up bit) - it is actually 34' long, although with a physical size of around 4'! This makes it much more efficient than other aerials. 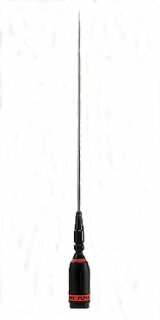 It is manufactured in Italy by a company called Sirio who are well known in the industry for their quality products and this aerial is well made and should give years of service. It is almost entirely black in colour with a black painted steel whip. These are the best vehicle aerials you can get - for sheer performance, at least. There are two versions - the 3000 is approximately 1.8m and the 4000 just over 2m, so they are both large aerials! Features a unique foldover facility to angle the whip. They are also different from the other aerials described here, and indeed most of the aerials available, in that they have a different mount fitting. Most aerials have a 3/8" thread on the bottom, that screws into the mount, whereas the Hi-Power uses a different sized thread, which limits the number of mounting options a little - although there are still magnetic mounts, gutter mounts, bracket mounts and through-a-hole-in-the-roof mounts available, so you are not too limited for options. Call to discuss the installation of this aerial if you want to get the very best performance. You cannot use the Electronic Ground Plane with these aerials. These mounts are designed to go onto either the top of a hatchback tailgate, or the top or side of a boot - a good alternative to gutter mounting on some cars. 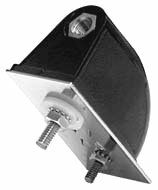 The principle of getting a good ground with boot and hatch mounts is similar to with a guttermount except that the screws holding the mount on are inside the underneath of the boot lip, so are not usually seen at all. Hatch mounts are adjustable for angle in most directions allowing you to fit them on sloping surfaces and still get your aerial standing upright. They are supplied with a protective rubber pad to prevent any damage to the paintwork. That pretty much brings us to the end of our Motorhome CB guide - if you need any suggestions for equipment, or have any questions, please feel free to ring us on 01306-881137 or email us.